Good evening darlings! I hope you’re having a lovely week. Can you believe Christmas is only THREE days away!? One of my favorite parts about this time of year is getting dressed up for holiday parties…including Christmas AND New Year’s Eve!! With that in mind, I first wanted to share with you a few party dresses I’ve recently purchased to wear this season and also show some of my favorite holiday dresses in stores right now! Now to show you some of my favorite dresses at many different price points. I’ve grouped them by three of my favorite looks: feminine sophistication (bows, ruffles, or lace), the classic little black dress (LBD), and fun & festive party dresses! 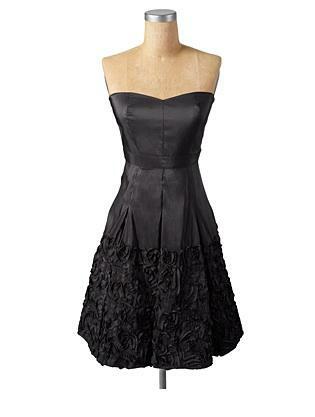 A look I love for holiday party dresses are feminine details like lace, bows & ruffles! Wear your feminine dress with soft curls for a sophisticated and romantic look. 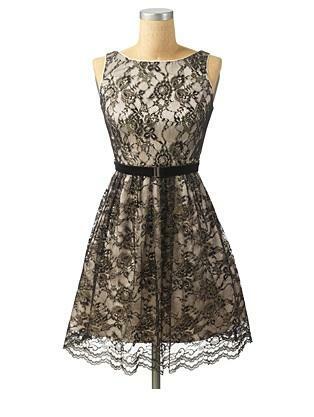 GORGEOUS lace dress by Milly! This Jessica Simpson Collection lace dress would look SO lovely with a strand of pearls! I LOVE the navy color of this Alice + Olivia Felicity dress along with the ruffled skirt. 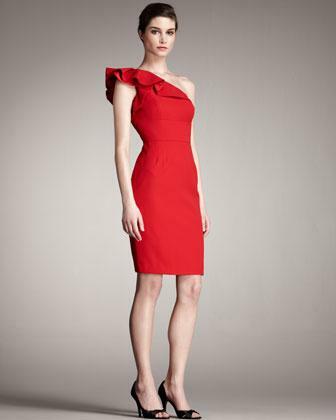 This dress makes such a statement in bold red with the ruffled neckline! I absolutely ADORE this ML Monique Lhuillier dress! It's perfect. The feathers on the hemline of this Theia dress are so flirty! Gorgeous. When in doubt on what to wear to a holiday party, you cannot go wrong with a little black dress! The LBD is so classy, versatile and a great investment. When styling your LBD think ACCESSORIES…dress it up with bold jewelry, statement shoes or a clutch. This is a fresh-twist on the classic LBD with the beautiful beaded neckline. The flowers along the hemline add a little something extra to this Jessica Simpson Collection LBD. When I think of New Year’s Eve I think of sequins & lots of sparkle! All of the following dresses would be SO much fun to wear to ring in the New Year. Just remember to let your dress steal the show & keep the rest of your accessories simple. LOVE the deep purple shade of this sequin dress from Express. This gold sequined dress from Cache is so pretty! I absolutely love gold sequins on this Kay Unger New York dress! Navy is a great option for evening wear and I love the cut of this dress. So what are you wearing to your holiday parties?! Leave me a comment and let me know! These dresses are awesome but my favorite is White House | Black Market Sequined Striped Dress.